With 87,000 flights crossing the US daily, aircraft and avionics equipment mechanics perform routine maintenance and repairs and carry out Federal Aviation Administration (FAA) inspections on aircraft. Working under strict deadlines to keep flights operating on schedule, these mechanics work full time in hangers, repair areas and on runways. Because of the seriousness of mechanical failure in airplanes, FAA certification is required for mechanics. This involves a minimum age of 18, fluency in English, a high school diploma or equivalent and the necessary technical skills, which are typically learned at an FAA certified Aviation Maintenance Technician school. The majority of the work involved is preventative maintenance. Physical requirements for this career include bending and stooping in smaller areas of the airplane being serviced as well as working on ladders or scaffolding due to the height of the craft. Mechanics typically take an FAA certified airframe and powerplant (A&P) certificate and often have a bachelor’s degree in aircraft maintenance and mechanics. Though education and certification is available with airframe maintenance and powerplant maintenance separately, most airlines prefer to hire individuals with the combined A&P certification. The certification requires a minimum of 1900 hours of coursework lasting one to two years which familiarizes students with tools, equipment and testing used on the job. Some military aircraft mechanics are able to satisfy the FAA work requirements for certification. This is the exception rather than the rule, however, as their experience is usually considered too specialized for commercial use and often are required to go through all the requisite coursework, though some credit may be granted for military experience. Military service is considered an advantage with most employers as it shows a degree of discipline and formal training. Additional education also provides opportunities for advancement. 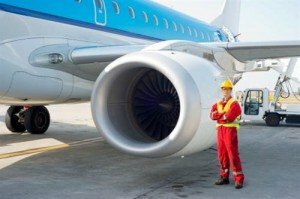 A mechanic holding an A&P certificate for a minimum of three years with at least 24 months of work experience can apply for an aircraft inspector’s authorization. Promotion in the airlines is often determined by examination. With the proper pilot’s licenses and flight time, a mechanic can become a flight engineer after taking the FAA examination, with possibilities of becoming a pilot. Having reached the age of 18, a person with good English communications skills should review available programs for FAA certification. Upon completing a certification program, it is up to the individual whether they wish to pursue a two- or four-year degree, though this would make them more competitive in the job market, especially at major airlines or large airports. Additionally, FAA regulations require you to either work 1,000 hours within a two-year period or take additional refresher coursework to keep your certification up to date. As aircraft advance, this keeps mechanics aware of new technologies. Many mechanics take advantage of classes provided by their employers. Median annual salary for an aircraft mechanic working on turbo-prop aircraft is $59,732, with an increase of approximately $16,000 for jet-engine aircraft. Promotion to head aircraft mechanic in either field results in an increase in pay of approximately $10,000 annually. Top head mechanics in the field can earn over $110,000 annually. Careers in aircraft and avionics equipment mechanics are expected to grow at an average rate, with competition remaining strong at major airlines and many additional opportunities available at smaller regional airports.